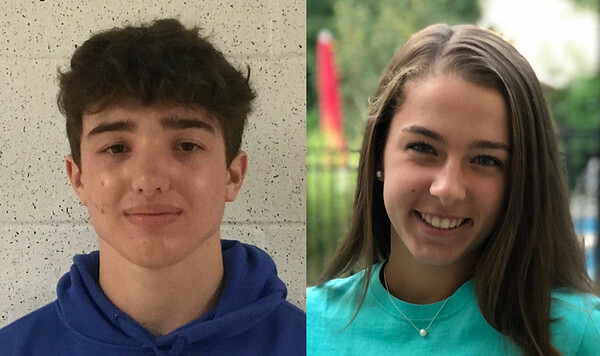 A pair of underclassmen that both have family members with local sports hall of fame credentials are our Athlete of the Week selections for area scholastic sports. They are sophomore shortstop Gwen Torreso of the Bristol Central girls softball team and freshman second baseman Ryan Daniels of the St. Paul baseball team. Torreso, the daughter of Ginny and Jeff Torreso, has been on a batting spree for the Rams, 2-3 on the season coming into this week. Her mother, a graduate of Bristol Eastern, is an inductee of the Bristol Sports Hall of Fame as a local three-sport athlete and basketball player at Pace University. Her grandfather, Greg Ziogas, a standout multi-sport athlete at Bristol Central, has been enshrined into the Plainville High School Hall of Fame as a successful boys basketball coach at the school. Toresso had three doubles last week in a 11-1 win over host Wethersfield and homered in a 4-1 loss to visiting Northeast Catholic. The Rams are coming off a 9-12 season. In addition to softball, Torreso also plays volleyball and basketball for the Rams. She’s been a right-side hitter in volleyball and will be learning the setter position for next fall. She started the sport as a freshman and likes the fact that it’s a constantly moving game and finds it fun to play. With basketball, she said, you have to know what’s going on at all times and that it’s also a moving, fast-paced sport. Softball is somewhat slower, but Torrseo doesn’t think it’s boring to watch. In short, for Torreso, it’s a general love for sports with no favorite. Daniels is the son of Peter and Wendy Daniels of Meriden. Like Torreso, he’s been hot with his bat and has four home runs already to date this young season. His hall of fame family member is his father, who is in the ECSU Athletic Hall of Fame for his hitting and pitching in baseball. Daniels, in return, talks about St. Paul baseball, a program that went 19-7 overall in 2018 and is 4-1 coming into this week. Daniels added that his job on the team is to hit well, score runs and get on base for Julian Thayer and Ryan Parent, the team’s power hitters. He started the sport in T-ball, like Torreso. Daniels concentrates on baseball as his one sport. Posted in The Bristol Press, Bristol Central, St. Paul on Monday, 15 April 2019 20:30. Updated: Monday, 15 April 2019 20:33.